A lifeboat like the one that fell during safety drill. MARSEILLE — One person has been killed and two others critically injured after a lifeboat fell from the world’s biggest cruise liner, the Harmony of the Seas, which was docked in the French port of Marseille. According to La Provence, a local newspaper, five members of the ship’s navigation crew were on board when the lifeboat became detached. The accident is understood to have taken place during a basic security drill. It is unclear precisely what the five were doing inside the lifeboat on the fifth deck of the giant ship as high as a 20-storey building. “One person has died and four suffered multiple injuries with two in a critical condition and two seriously hurt but stable,” said a spokesman for Marseille’s marine emergency service. “The lifeboat became detached” from the boat owned by Royal Caribbean, an American company, said a police source. Julien Ruas, of the Marseille marine services, said the life boat “fell 10 metres” with the five people inside. “All were members of the crew,” he told 20 Minutes, a newspaper. The person killed is a 42 year-old man of Philippine nationality. There were no details on the other people injured. At 1,188 feet from bow to stern, Harmony of the Seas is 125 feet longer than the height of the Eiffel Tower and one foot longer than the previous record-breaking cruise ships Allure of the Seas and Oasis of the Seas. The 16-deck ship has 20 restaurants and 23 swimming pools including the “Ultimate Abyss” water slide, a looping chute which hangs from the back of Harmony and drops 100ft. It took more than two and a half years to construct. In May thousands turned out at the Saint-Nazaire shipyard in western France to watch the huge ship set sail. However, the $1.05 billion vessel swiftly hit controversy shortly after it left Southampton for Rotterdam on a four-night trip on May 22 with around 6,000 passengers on board. Some of its first customers claimed it was still a floating “construction site” and protested about ongoing work and closed attractions. They tweeted pictures of overflowing urinals, uncovered drains and muddy carpets. Passenger David Mitchell, 73, from Lincoln and who paid around $1,320 for his ticket, said his four-night stay on the cruise ship was “a shambles”. The boat’s completion saw Royal Caribbean announce its intention to order three more giant liners for $2.8 billion. After calling at Southampton, she sailed to Barcelona and Marseille and is due to ply the waters of the western Mediterranean to Naples. 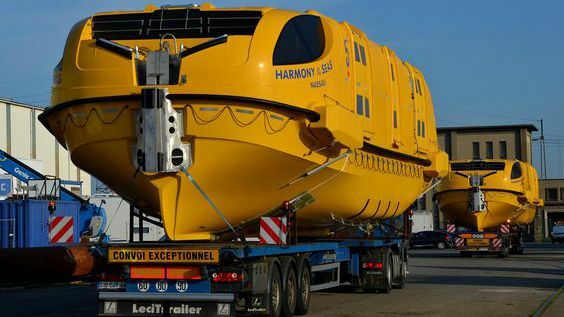 Julien Ruas, a deputy mayor of Marseille, said that the lifeboat fell about 33 feet from the fifth deck of the Harmony of the Seas into the sea with the five crew members aboard. He identified the dead crew member as a 42-year-old Filipino. Circumstances of the accident are still unclear. Local naval firefighters said that one person died, two were seriously injured and two were more slightly injured in the “violent” fall. All were members of the crew. “It seems the people didn’t get the time to secure themselves so the fall was quite a violent one, like if you or me fell around 10 meters from a building,” Ruas, who is in charge of firemen, told The Associated Press. He said the reason the lifeboat broke away was not immediately clear. The Miami-based Royal Caribbean cruise line “deplored” the death and said in a statement that the incident happened during a safety exercise while the ship was docked in the port of the Mediterranean city. Royal Caribbean Harmony of the Seas debuted May 17, 2016 becoming the line’s 25th ship in the fleet and taking over the title of world’s largest cruise ship. It will sail the Mediterranean this summer and reposition to Port Everglades in the fall. At 362 meters (1,187 feet) long, the 16-deck ship is longer than the height of the Eiffel Tower. It’s been compared to a floating city with more than 2,500 staterooms, 20 dining venues, 23 swimming pools, water slides, a park with more than 10,000 plants and 50 trees, two climbing walls, discos and bar clubs, a theater, a skating rink, a basketball court and a casino. 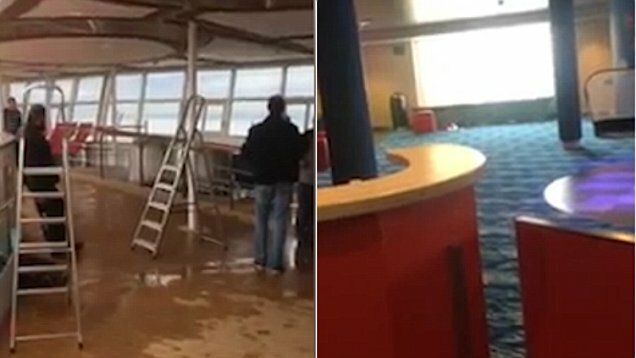 PUBLIC RELATIONS NIGHTMARES (ALA THE MAPP ADMINISTRATION): Royal Caribbean cruise ships have sailed into hurricanes unnecessarily and returned with storm damage, come back from maiden voyages with overflowing toilets and urinals … and now killed a cruise ship passenger during a “safety” drill.